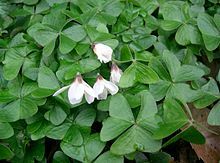 Oxalis is a also known as wood sorrel or false shamrock. Many varieties are occur around the United States, some weedy, others sold in nurseries as a shade annual/perennial. When we lived in central California the kids picked it by the handfuls and enjoyed munching on it. We knew it as ‘sourgrass’ and it is an edible, used by humans around the world for centuries. It looks pretty in a shade garden, or in a container. Plants are available in green or red leaf, producing a white flower. Next Next post: American Idol — The Plants Perform!